Independent service shops and vehicle tuners require more information than what OBDII can provide to do their job effectively. Since the OBDII standard covers only emissions-related power train systems and sensors, there is more information you won't be able to see with a generic OBDII scan tool. With our enhanced interface options, you can get factory tool-like capabilities; allowing you to access hundreds of systems (ABS, airbags, instrument cluster, etc. ), sensors, and system/component-level bi-directional controls so you can do your job faster and with a greater degree of accuracy. In the professional repair business getting as much coverage as you can is important to effectively and quickly service any vehicle. We offer enhanced coverage options for 43 car brands: Ford/Lincoln/Mercury, GM-family, Chrysler-family Toyota/Lexus/Scion, Mazda, Nissan/Infiniti, BMW/MINI, Land Rover, Honda (Acura), Subaru, Mitsubishi, Isuzu, Porsche, Mercedes, Hyundai/Kia, Jaguar, and Audi/VW. So you read your vehicle's trouble codes, now what? Reading the trouble codes from your vehicle is easy. But without live data and bi-directional controls, you may not have enough information to properly perform the repair. Don't waste your time or money with simple code readers or hand-held scanners. ACI OBD2 scan tool can not only read your codes, but it can also show you live data, actuate components, and run system tests. With complete coverage, you can get the job done right the first time and prevent dreaded” comeback". Although Ford does implement the largest subset of the OBDII standard, the typical vehicle only supports 20 - 40 sensors and is limited to emissions power train. Using the enhanced Ford interface, a typical Ford vehicle will support 200 - 300 sensors within half a dozen systems; that's essential systems such as ABS, airbags, GEM, ICM, etc. Our enhanced GM interface supports 6,400+ sensors selected from the engine, transmission, body, and chassis systems. For you tuners out there, our enhanced GM interface gives you access to the Crank Variation Learned test for most vehicles. Also, with our enhanced GM coverage is support for Workhorse 04+ MY vehicles (P42 Series,W22 Series, W24 Series, W52 Series, LF72 Series, P32 Series, W18 Series, FE20 Series,W42 Series). Support includes dual-wire and single-wire CAN power train support. Our enhanced Nissan interface supports code retrieval/resetting, sensors, and actuations from the engine, BCM, transmission, ABS, airbags, 4WD systems, and CAN systems. Coverage includes the Work Support configuration commands such as Target Idle Ignition Adjustment; with it you can permanently advance your ignition timing to gain few extra HP. Trouble code retrieval includes the NATS 5.0 system and the detailed status byte support. Our enhanced Mercedes interface supports thousands of sensors and hundreds of bi-directional controls for systems such as DME, EGS, ABS, AAC, BAS, SRS, WSS, EWS,CGW, ICM, DAS, MRM, LCP, UCP, OCP, SAM, and dozens more body and chassis controllers. 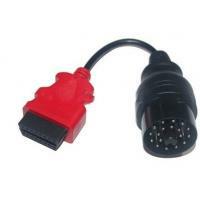 Support includes systems on both the 16pin OBDII and 38pin interfaces. Live data, bi-directional controls, and trouble code retrieval for the popular M and GL Class (163 / 164), SLK Class (170 / 171), C Class (202 / 203 / 204), CLK Class (208 / 209),E Class (210 / 211), CL Class (215 / 216), CLS Class (219), S Class (220 / 221), SL Class(230), B Class (245), R Class (251), G Class (463), and V Class(Viano/Sprinter). Trouble code retrieval only for DAS 3 equipped S Class (140) models currently.